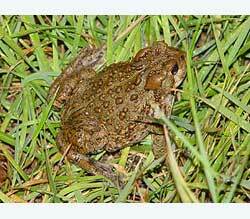 Origin: The western toad has an extensive range in North America. They are found primarily in the western United States east to parts of Colorado, and north to extreme southern Alaska. As with most other Bufonid species, a low aquarium with ample floor space works well for this species. A pair can be maintained in a standard 10 gallon aquarium. Although it is unlikely that the western toad would be able to escape from an enclosure of this size, it is a good idea to provide a tight-fitting screen lid to allow for ventilation while preventing the intrusion of other pets. Western toads are diurnally active at times, and it is a good idea to provide artificial lighting to simulate natural photoperiod and allow for proper metabolic activity. A fluorescent light, for instance the Zoomed Reptisun 2.0 is an excellent choice in lighting, as it provides both a UVA and UVB light source, but does not produce excessive heat. It is imperative to not allow the cage to become too hot, as these animals will quickly perish. As such, an incandescent bulb would not be an acceptable light source, unless required to heat a very large terrarium. The temperature should never get higher than 80 degrees Fahrenheit. A substrate that allows the western toads the possibility of burrowing is also a good idea for the successful maintenance of this species. The substrate should be kept somewhat damp in order to prevent desiccation. A handful of the substrate should clump when the appropriate level of moisture has been attained. If the clump disintegrates in your hand, it may need a little more water; if water oozes out of the clump, you may need to dry it out a little. It is also necessary to provide a shallow water bowl as a source of fresh water. Feeding western toads in captivity rarely presents any difficulties. A staple diet of crickets works very well with this species. Mealworms, wax worms, earthworms and tomato hornworms can be used to provide a varied diet. The food items should be dusted with a vitamin/mineral supplement once weekly for adults, and more often for juvenile individuals still undergoing periods of rapid growth. Western toads will soon become very accustomed to their keeper and will frequently hand feed.